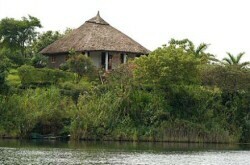 Nyinabulitwa Country Resort is located just about 20 kms off Fort Portal in the western part of Uganda. The resort surrounds Kibale Forest National Park acknowledged to be the most gorgeous tropical rainforest in the country with eye-catching birds and insects. It has different species of primates with about 1400 population of Chimpanzees. The resort has well designed accommodation with self contained cottages that put up both double and single beds with high quality services. The forest is habitant to many animals such as buffaloes, bush pigs, elephants, duikers and many reptiles. The resorts have tour guides that will lead you through the forest. The tree house will give you a perfect view for seeing birds and monkeys. A forest walk will give you a chance to get closer to some primates and birds. The lake offers many activities such as swimming, fishing, canoeing as well as Kayaking. Mountain biking and hiking are also great games. The restaurants serve both international and local cuisines. Some of the food is got from the garden and is prepared to the visitors. The resort has a craft shop with all African items managed by the community women group. Get for yourself something that will always remind you of Uganda as a great country.